Tea lover gifts are more fun to shop for than you may think. If your holiday shopping list has a tea fanatic on it, you can get them some pretty unique products. Being a person who is always cold, I love all hot beverages and gifts that help keep me warm. 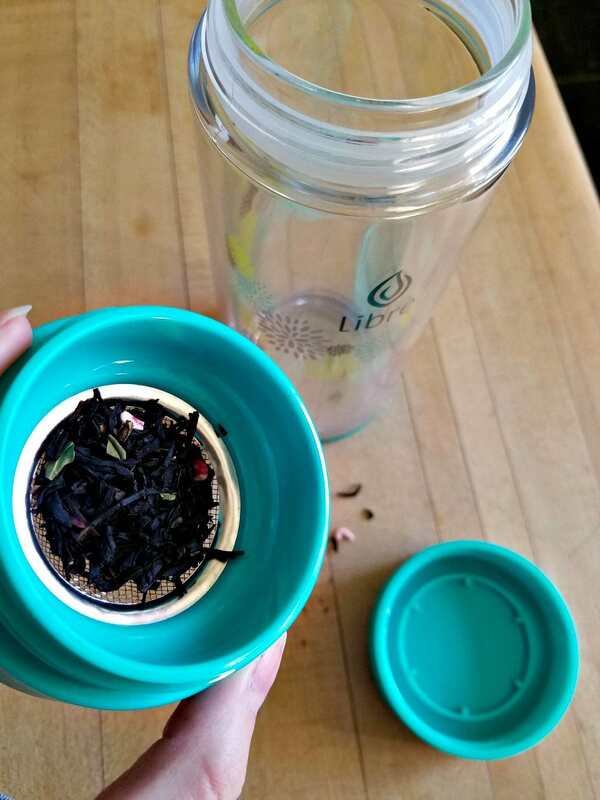 Libre infusers let you take your tea on the go. Fill your glass with loose tea, herbs, or even fruit for delicious hydration anywhere. The BPA-free glass interior allows for the freshest taste. The durable poly exterior protects the outside, and the removable stainless filter keeps the leaves and herbs in the glass. Of course, you don’t have to go anywhere to use your Libre infuser. For people like me, who have spilled on their desk too many times to allow open mugs, the safety of a to-go mug is always welcome. Make tea drinking extra pleasurable with all sorts of loose tea and herb combinations. Libre allows tea lovers an entire experience while they watch the beautiful tea leaves dance in their glass. A glass infuser mug is sure to impress the tea lover on your list. I guess I am not adventurous enough in the tea world because I didn’t even know some of these products existed. Flavored tea drops? How fun. We experimented a bit baking Matcha recipes but definitely didn’t explore the ways to drink tea enough. Now that the polar vortex is officially here, that’s going to change. Bring on all the hot drinks. Or how about some honey to go in the tea? Some people like their tea straight up, but plenty of people add sweetness. If you get the right honey, it also provides many health benefits. Can’t go wrong with the gift that keeps on giving, either – a tea subscription box gives months of yumminess. Make the simple act of brewing tea a delightful one with hilarious tea infusers. I mean, a baby dino or a hippo hanging out of my mug is enough to start my morning off right. If you know someone who drinks a lot of tea, they will surely appreciate these cuties, as well. Ever read up on a certain herb and immediately want to try it? You can buy empty tea bags and fill them yourself. Use caution here because herbs have side effects. As much as I would love to play potion-maker, I know that I need to do my homework first. However, if you know someone who’s picky about their tea, empty tea bags and some of their favorite ingredients would make an amazing gift. We also used the empty tea bags to make rose petal tub tea, so they are good for more than drinks! As you can see, tea lover gifts are out in abundance. Have fun with it and create a truly unique gift package for your tea fan. 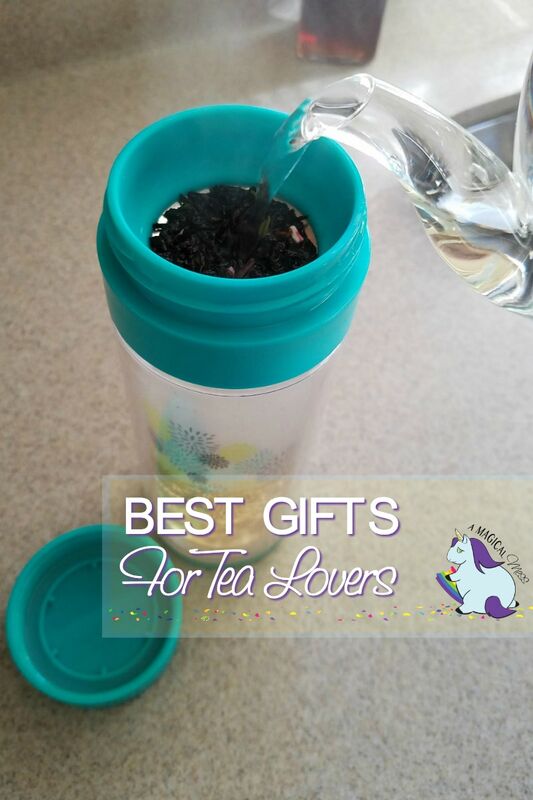 Do you have any tea lover gifts to add? I would be so happy with any gift that has to do with tea. Mugs and cups are always a hit with me. I love the cute Tea Diffusers’s also. I love the fun diffusers. I like tea and would love any of these. A collection of good ideas, and a teat related gift would be used every day! I like the tea glass diffuser and it looks like a great bottle to get for a tea lover like me. I like drinking all kids of blends of tea, and these are great ideas to get for the Holidays!